“Centennial History of Snohomish County” col. 1-5, page 4, July 8, 1876: www.sos.wa.gov/quicklinks/CentHist1; Page 5 (continued): www.sos.wa.gov/quicklinks/CentHist2. “Hyas Potlatch” col. 1, p. 2, July 22, 1876 (an article written entirely in Chinook Jargon): www.sos.wa.gov/quicklinks/Potlatch. Ambitious readers may want to translate, using this “Vocabulary of the Chinook Jargon” from the 8/6/1864 Seattle Weekly Gazette: www.sos.wa.gov/quicklinks/Chinook. “J.R. Thompson Travel Account” col. 2, page 2, July 14, 1877 (a travel account of the Walla Walla and Snake river valleys by J.R. Thompson with his thoughts on the Nez Perce Indian war): www.sos.wa.gov/quicklinks/Thompson. The Northern Star joins Olympia’s first papers, The Columbian, The Washington Pioneer and The Pioneer and Democrat, that cover 1852-1857. Also included in the collection are historical newspapers from the cities of La Conner, Lynden, Port Townsend, Seattle, Spokane, Steilacoom, Vancouver, Walla Walla and Yakima. Additional newspapers will be brought online as they are scanned and indexed. The newspaper Web site was purposely designed for students, genealogists, and historians to easily access historical information. It provides viewers with the ability to search by keywords, dates, subjects, and personal names. To view the newspapers, please visit www.sos.wa.gov/history/newspapers.aspx. This is the fifth in the series on the Presidents of EWGS leading up to the 75th anniversary in 2010. See the previous post on Samuel Pool Weaver , the previous post on Leora Cookingham Thiel, the previous post on Susan Marie West Jack and the previous post on Ruth Churchill Austin. Alfred Monroe Denman was EWGS President 1943-1944. He was born in Spokane son of Monroe Denman a farmer in the Hillyard region. Monroe was a fifth generation descendant of Scotch and North English descent and was born March 10, 1858 in Morristown, Minnesota. Monroe married Esther Piper in Spokane September 14, 1884, she was born May 31, 1864 near Lester Prairie, McCloud county, Minnesota, third daughter of William Enos Piper (1837-1928) b. Horatio, Pennsylvania died Spokane and Sarah Ellen Mayze (1843-1933) b. Marionsville, Pennsylvania died Spokane. Both of Pennsylvania Dutch descent. Alfred Denman married Lillie Rose in 1914 a native of England. The obit for Monroe Denman says he was the Oldest Spokesman-Review carrier and his route covered 75 miles daily. He was 73 when he died in his car. Lilly Rose died July 27, 1968. Alfred Denman died December 28, 1979. Lillie, Esther, Monroe and Alfred Denman are all buried in Orchard Prairie Cemetery. Alfred Denman was also a member of the Spokane Public Library Friends of the Library. Comments from Carrie Lartigue on Alfred M. Denman: "He was a determined man and good researcher. He was into many organizations; Sons and Daughters of Washington Pioneers, S.A.R., and others. He was especially proud that he still lived on the old family homestead in the Hillyard area." 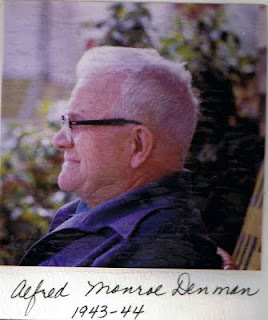 Hi, I found the article on the Denmans' very interesting, you see Alfred Denman drove the school bus I rode to Arlington grade school; on to Rogers High School, during the late 1940's; 1950's. Mr Denman may have been one of the very first that cultivated my lifetime interest in History; later on Genealogy. One of my first memories instilled even today was Mr. Denman telling me how he still lived on his family's homestead that sits just above the road that curves off North Freya and onto join Market street to the east. I have never passed the old homestead sitting above the north side of the curve in the road, with out thinking of Mr. Denman. He told how his father's homestead was chosen to enable the family to observe any Indians that might approach the place. Just recently, I have noticed the new North highway being built is encroaching right through Mr Denmans old homestead. This has made me very sad to think about. Mr Denman was very proud of his roots in that area. Once Mr Denman discovered my father's family the Gardners settled on Pleasant Praire [in the] 1880's, Mr Denman would speak of old timers in the foothills north; east of Hillyard as if I could recall them, I wasn't born until 1942. Now that I read of Denmans roots; see his father was married to daughter of Pipers, I recall my father pointing out the old Piper homestead on Bigelow Gulch road that heads across the top of the prairie joining the road down to Millwood. This old home sat vacant all the time I was growing up. The trees grew up around it; made it quite scary looking to children. When we rode our horses by there we did so swiftly. In the last 20 yrs or so, someone restored that old homestead; it now looks great. Those foothills are steeped in Spokane county History. Years ago when the original old wooden, St. Michaels Mission was moved out to Spokane Falls Community college. While growing on the edge of Bigelow Gulch in the 1950's, all us kids with horses would ride to the old Mission, tie up our horses; picnic, it was such a beautiful peaceful place. Never was there any vandalism, garbage or trash laying around. That was a wonderful time to grow up when remnants of history still remained; children were taught to respect them all. Passing by the location today breaks my heart, sitting askew by the ditch, is only a monument noting the location where many Indian people received their first communions, close by with brush grown over are graves of native people that once inhabited the foothills; southern Peone Prairie. The descendants of those buried there I believe for the most part moved onto the Flathead Reservation of western Montana along with Baptiste Peone, some did move to Fort Colville. Spokane co. land records show Baptiste's sale of his land on the southern edge of Peone Prairie, Indian records show Peones living on the Flathead reservation, after leaving the Spokane area. Mr. Denman came off as a grouchy ole character as I remember, but he ran a tight ship on the school bus all those years. I think he had to come off in the former light to remain in control of a bunch of rowdy kids. However once those same kids boarded the ole yellow school bus, at times traveling over some pretty icy roads, they towed the line the entire trip to and from their school. I was either the first or last to climb on his bus in the mornings; visa versa when going home in the afternoons. I had the choice of getting on first or waiting for the bus to travel its route; then pick me up on the way by as it passed by my home on the corner of Francis; Freya, once a Stockyards, close to the Great Northern cattle loading pens, with several homes on the property. Therefore many times I was on Mr Denmans bus alone, the gabby kid I was; I'm sure I climbed up in the seat behind Driver Denman; talked his leg off. I think of him fondly today; would love to walk over his family's homestead with a metal detector, knowing what is occurring there now I know in my heart Mr Denman would appreciate my interest. P.S. Randy Seaver has written a wonderful tutorial on using these databases on his genealogy blog, Genea-Musings. Historical Newspapers in Washington – 1 new title. The years 1861-1864 have been added to the Puget Sound Herald in Historical Newspapers in Washington online project, which now covers six years of Steilacoom pioneer news, from 1858 to 1864. The Community Analysis Report concerns how authorities should “deal” with the Japanese and Japanese American people they have incarcerated through an understanding of their customs and cultural background. Causes of social unrest, segregation, education, Buddhism and labor relations are topics covered within these papers. The Community Analysis Notes “reveal the life experience and viewpoints” of the incarcerated Nisei. Why did many young men say “no” to two questions on the Army registration form? How did the Japanese deal with engagement and marriage in the camps? How did it differ from pre-internment days? How did they adjust to life in the camps? The Project Analysis Series analyzes various events that occurred during the relocation project. What happened at Tule Lake in November 1943? Why did it happen? What was the reaction to opening Selective Service to Nisei? What are the motives behind Nisei requesting repatriation? The editor of the Puget Sound Herald, Charles Prosch, recounts his memories and opinions feely on such subjects as newspapers, the army, churches, and doctors in the early days of Washington Territory. Account of the Seattle general strike from the point of view of the unions, written by the History Committee of the General Strike Committee. This Letter to Gov. McMullin from F. A. Chenoweth, a justice on the Territorial Supreme Court, concerns his role in and opinions on the controversy over the proclamation of martial law by the previous governor, Isaac I. Stevens. He outlines his disagreements with Stevens and explains his actions during the events and his disapproval of the arrest of Judge Landers. This small book contains the diplomatic correspondence between the U.S. and England regarding the claim of America to the Oregon Territory. These arguments and counter-arguments were part of the negotiations leading to the Treaty of 1846 and the establishment of the border between the U.S. and what is now Canada. The Whitman Massacre of November 29, 1847 provides a painful window into a time of conflicting cultures, priorities and prejudices. The State Library has added two works to the Digital Collections that further illuminate this painful event. For decades after the tragedy at the Whitman Mission, writers, preachers and others sought to place blame for the event itself and for the underlying causes. Resentments against the Hudson’s Bay Company and religious prejudices often colored narratives, and led to charges of cowardice or malice. One viewpoint comes from Fr. Brouillet, the Catholic priest who first discovered the massacre and helped to bury the dead. His brief book, published in 1869, attempts to refute Rev. Henry Spalding’s accusations that the Catholics fomented resentments against the Whitmans among the Indians. He does this by gathering statements and letters from people present in the territory at the time and involved in the events, and by trying to analyze the underlying causes. See an Authentic account of the murder of Dr. Whitman and other missionaries in Classics in Washington History. This work contains three separate sets of letters from Narcissa Whitman to her friends and relatives, both back east and in the Oregon Territory. The collections include several letters from Marcus Whitman as well. The letters were published as part of the proceedings of the Oregon Pioneer Association, and the speeches and committee reports of the Association are also included, as is a separate essay on “The Schooner ‘Star’”. The letters reveal a woman who is determined to live up to her religious ideals. She accepts the loss of home and her extended family. She accepts her husband’s frequent absences and the physical hardships of frontier living. Yet, she continually begs her family to write more often, and is without any letters from home for two years due to long distances. She is never quite at home with the Indians and has difficulty learning the language. There are hints in her narratives about the tensions among the missionaries and the discouragement when few others arrive to join the mission effort. The letters, though relentlessly optimistic, create a portrait of an intensely social and conventional woman laboring in isolation and surrounded by a culture that remains foreign to her. We are excited to announce the release of our latest interactive collection: the Native American collection. Working together with the National Archives and Allan County Library, Footnote.com has created a collection featuring over 1.8 million records that will help people discover new details about Native American history and genealogy. This is the fourth in the series on the Presidents of EWGS leading up to the 75th anniversary in 2010. See the previous post on Samuel Pool Weaver, the previous post on Leora Cookingham Thiel, and the previous post on Susan Marie West Jack. The fourth president of EWGS was Ruth Churchill Austin in 1941 and 1942. 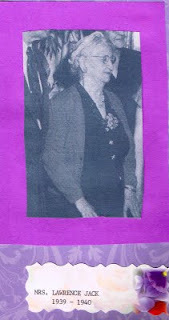 She was also another founder of the Spokane Public Library Friends of the Library. She was born 1884 in Niles, Michigan to Francis N. Churchill and Ella L. McKay. Francis died 27 September 1937 in Spokane county and Ella died 11 April 1927 in Spokane. Francis was the son of William and Olive (Remington) Churchill and Ella was the daughter of A. and Sarah (Mayhu) McKay. Ruth married John Frederick Austin here in Spokane November 23, 1904. John was born in Bay City, Michigan April 3, 1883 and is an eighth generation descendant of Robert Austin of Kingstown, Rhode Island (The book on Robert Austin is in the genealogy collection of the Spokane Public Library). Ruth and John had two children: Helen Austin b. August 13, 1906 in Seattle, Washington and John Churchill Austin b. October 19, 1914 in Spokane. John Frederick Austin was a floriculturist and horticulturist and organized the Spokane Flower Growers association and managed it from 1925 to 1948. He was president of the Society of American Florists from 1942 to 1945 and a director of the society from 1935 to 1944. He was a member of the Northwest Florists association, board member of Associated Industries of Spokane, Early Birds Breakfast Club, Spokane Club, and El Katif Shrine. He was a trustee of the Chamber of Commerce and past President of Spokane Retail Trade bureau. He died January 25, 1951 in Spokane and was cremated. Ruth (Churchill) Austin died in Seattle November 24, 1973 (her daughter Helen lived in Seattle). She had been a member of the Daughters of American Revolution and Eastern Washington Genealogical Society. Ruth also had donated many books to the Spokane library and was generous with cash contributions also. Comments by Carrie Lartigue on Mrs. Ruth Austin: "She said many times, 'You can't separate history from genealogy, both are composed of events and people and genealogy is only history with the personal touch.' Ruth also gave books to add to the collection at the library." If you are a Legacy Family Tree genealogy software user, or are simply curious about this genealogy software program, you may be interested in the Legacy Users Group (LUG), which will meet next Wednesday, November 18th, from 1:30 to 3:30 PM in the meeting room of the Shadle Park Branch of the Spokane Public Library at 2111 W. Wellesley. Regular attendees will take turns in the role of moderator for each meeting. If you have more questions, please contact Donna Potter Phillips here. This is the third in the series on the Presidents of EWGS leading up to the 75th anniversary in 2010. See the previous post on Samuel Pool Weaver, and the previous post on Leora Cookingham Thiel. Susan Marie West Jack was the third EWGS President, she served 1939 and 1940. Susan was born February 14, 1878 in Iowa. Susan Marie was the sixth child of Francis Marion West born 12 March 1845 Franklin County Indiana, and Jemima Harvey born 12 January 1848 and died 10 July 1932, and granddaughter of Stephen Harvey born 6 October 1811 and Susanna Lee born 10 July 1827 and James Lytle West born 22 December 1815 in South Carolina, and Susan West of Brookville Indiana. While her surname is the same she is from a different West family. The Harvey and Lee families were from upstate New York, and the West family was from North Carolina area but believed to be from early New England West families (no sources on this last statement so take it as a suggestion for further research). 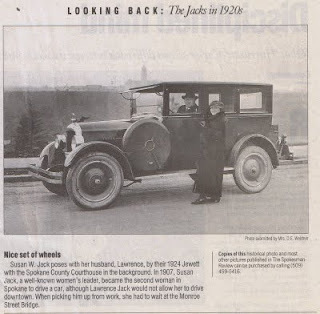 Susan Marie West married Lawrence Jack in Altoona, Iowa 2 May 1906 and they came to Spokane the same month. Lawrence Jack was born in Bruce County Ontario Canada 22 March 1876 and he died 25 August 1926 here in Spokane. In the 1915 City Directory Lawrence was listed as a lawyer 610 Hyde Building. I checked for his obit and did not find one. They had one son Lawrence Jack Jr. born 22 March 1907 here in Spokane. Susan died 25 August 1975 at Bainbridge Island Washington. Her granddaughter Suzanne M. Gordon lived at Bainbridge Island. She was a member of Women of Rotary, Eastern Washington Genealogical Society (past President of both of these), YWCA, Cultus Club, Liberty Park WCTU, Daughters of American Revolution, and co-founder of Spokane Public Library Friends of the Library. She is buried at Riverside Cemetery. Comments on Susan Jack , by Carrie Lartigue: "Susan was a charter member and traced her lines back to the Robert E. Lee family in Virginia. She generously gave of her books and talents. I have as personal keepsakes from her; several hand-painted plates."